Serve at room temperature or chilled. Store in a sealed glass jar in the fridge. Finish on the same day. Flax seed oil provides omega - 3 & 6 which is needed for a healthy diet. 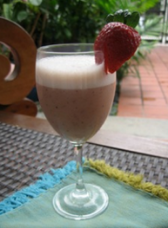 This smoothies makes a perfect breakfast or a good mid afternoon snack!